Suffering from sleep apnea or heartburn? Those are the two main reasons why you should use a wedge pillow. Since it is moderately firm, it gives you the power to raise your head during sleep and eliminate the symptoms of snoring, sleep apnea, or heartburn. A comfortable sleep allows you to be productive the next day. We believe the better pillow you have, the longer rest you can enjoy. Wedge pillows can make a difference in your sleep and relaxing moments alike. But aside from the above-mentioned benefits, there is still so much more a wedge pillow can offer. It helps you maintain a proper spinal alignment, especially if you are experiencing distress over a chronic lower back, neck, or leg issue. This is because it can support your whole torso and allows for a well-supported lower back. Aside from that, its second function is to allow you to raise your knees so that you can ease the pressure in your lower back. As people get older, more and more circulation issues are being faced. This is why it is good to have wedge pillows, especially those that have higher inclines to keep the shoulders and arms relaxed, as well as the knees and legs when placed underneath the feet. Most of the time, those who watch television or read prop up pillows to feel comfortable while doing the said activities. 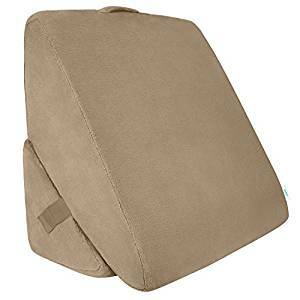 However, having wedge pillow allow you to have headrest or backrest. It is more effective if you purchase something portable so that it can be used in sofas and chairs. Have you indulged in too much food? Or have you eaten past your bed time? Say goodbye to abdominal pain or acid reflux because a wedge pillow will grant you the power to easily digest. As a tip, doctors recommend that you sleep on your left side so that food can process effortlessly while keeping you comfy and undisturbed. Next, if you have a sleep and breathing disorder, this pillow can ensure greater airflow and less obstruction increasing your quality of sleep. If you want something fluffy, this pillow will provide extreme softness, support, and supreme comfort. The feathers inside the pillow are similar to carbon fiber and since they are curled, they serve as a natural spring. If movement is of prime importance to you, having memory foam wedge pillows allow you to easily adjust your position at any time of the night. Whether it is your head, neck, and shoulders – you can be sure that a restful sleep awaits you in the most natural position since these can adjust by themselves, accommodating any position you have at any moment. In desperate need of something hypoallergenic and dust-mite resistant? Latex wedge pillows offer both. It is breathable and snug, perfect for those who sweat a lot and those who are experiencing hot flashes. In addition, it helps you have an excellent neck and shoulder support, which reduces cases of cervical stiffness and arm pain. Read our latest guide about the best feather pillows. As the name suggests, the memory foam has been shredded into small pieces so that the user can feel better breathability. Though a memory foam can be adjusted to any position, a shredded memory foam is still more flexible. Among the list, this is an economical option. Also, they are quite easy to maintain and are durable for a long time. However, others do not prefer this because of health concerns which highlights the chemical compounds used to create this. The right wedge pillow can do wonders for you. Of course, everyone already considers the price of a pillow, but there are so much more important factors to consider other than that. The question would always be, how do you know what wedge pillow can give the maximum comfort for you? Here is a list of what matters most when evaluating the perfect wedge pillow. Though it might seem like a wedge pillow only comes in one size, you have various options! What bed will you use it for? Is it for twin, queen, or king sizes? You can find other sizes in the form of small, medium, large, or extra-large. The most important thing to check is the dimension of your bed. The ideal pillow match will be something that can fit your bed just right. But aside from that, take also into consideration your size, because in the end you will be the one struggling if you think it doesn’t fit your style. In addition, a wedge pillow is further divided into three types under the height category. Low wedge pillows usually measure between six (6) to eight (8) inches, ideal for battling acid reflux, sleep apnea, and more. Next is the mid-height pillows which usually measure between ten (10) to twelve (12) inches. It is excellent in preventing sore muscles, aches, and pains during the day. And last but not the least, tall wedge pillows are about fifteen (15) inches high. It is a good support if you want to read or just simply binge on television shows. Moreover, the size of the pillow also tells you if you can bring it when you travel outside the comfort of your home. Is it foldable? If yes, then that’s something positive you can consider about a product. Is it travel-size, something that you can bring at the airport? Then, if you are the type who frequently travels, you must absolutely consider this. Typical materials are polyurethane foam or memory foam. It is vital to know the material because it also helps you identify if you are purchasing a wedge pillow that fits your needs. For example, a polyurethane foam acts a firm support for those who choose to sleep on their back. On the other hand, the memory foam are ideal for those who want to sleep on their side since it can easily follow the body shape and position of the user. Polyfoams are usually the popular choice since it is much cheaper than memory foam. However, polyfoams have less lifespan than memory foam models. But don’t be discouraged because even if they have a lesser life, some products are also at par with memory foam pillows which you can also consider when buying. If there’s an immediate need for you to purchase wedge pillow but you have limited money, then polyfoams are a perfect choice for you. In hindsight, you can also compute how much you pay for it in a day within a span of a year and you’ll feel better because it will serve a greater purpose for your body. Also, ideally, you should choose a wedge pillow that has a removable cover since it can easily be prone to dirt. You would want to keep your pillow in a sanitary or hygienic condition. Further you should consider the durability of your wedge pillow. You wouldn’t want to purchase something that will only last for a few weeks or months. Make sure to check the warranty coverage because most of the time, it also tells just how much is the lifespan of your wedge pillow. Another thing to consider after knowing the material of your pillow is whether you want something breathable or something that keeps the heat of your body. Foam pillows usually tend to trap the heat of your body in the pillow which can be rough for people who are already experiencing hot temperature. The usual materials that may help cool your sleep are bamboo, polyester, and poly-based synthetic fabrics. Last but not the least, do you want a flat or contoured surface? Flat surfaced wedge pillows are good for the head, neck and shoulder. Meanwhile, contoured pillows are made to align the natural curves of your body especially the neck, shoulders, and spine. Moreover, it is also good for side sleepers as well. For your physical and mental relaxation, Relax the Back’s Adjustable Bed Wedge Pillow offers supreme comfort system. Indeed, it is your best choice when reading, watching, or just simply meditating. The support level is incredible, it has amazing design and it is a true to art innovation. 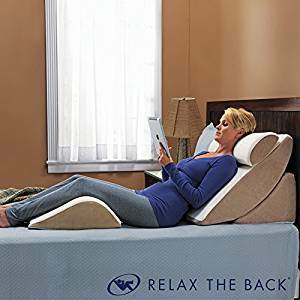 There’s really instant relief with Relax the Back as it allows you to be at peace when you sit or when you lie down. Its dimensions are 13”-24” in height, 24” in weight, and 17”-29” in length. For further explanation, here are each pillow dimensions: incline base (15”W x 11”H), leg support (19”W x 6.5”H), back support (28.5”W x 7”H), and neck support (10”W x 4”H). Since it is pretty bulky, it’s not good for side sleeping. However, it is effective for your neck and back issues aside from preventing vertigo. It may also not be ideal for some, especially post-surgery patients since it is bulky. It has removable plush cotton covers which can easily be washed. Also, the wedge pillow is made from memory foam which gives it flexibility. As a result, it can provide relief to knee pain, muscle spasms, varicose vein, and lower back pain. Several reviews mention this as the best vertigo wedge pillow. The whole set offers 4 wedge pillows which are for leg support, back support, incline base and neck support. Prevent vertigo from ever ruining your day. Top-notch service brought to you by Cushy Form – ideal for sleeping, reading, resting, or elevation. Your back, shoulder, and neck pains will never come again once you have this. Plus, you’ll never writhe from a bad posture anymore. Last but not the least, no more burning sensations from acid reflux or heartburn. This well-made bed wedge pillow is suitable for men and women who aim to achieve better breathing and circulation. Although its appearance may look like any typical wedge pillow, it’s praised for its high quality and quick relief. The dimension of this product is 25 x 24 x 12 inches. Its therapeutic qualities will ensure your happy and relaxed state at any activity you intend to do. And since it is a memory foam that is cushy, the pillow easily molds to the contours of your shoulders, neck, and head. But don’t be deceived by its softness, it is also strong enough to support you at any angle you want to be in to catch your sleep. The comfortable wedge pillow has a soft and breathable cover! As a result, you will be able to maintain a comfortable temperature during your sleep and you don’t have to worry about it being stained because it is machine washable! With its excellent upper back and shoulders support, it promotes a better sleep position for you. Thus, it reduces snoring, allergies, breathing issues, fights acid reflux, and relieves neck as well as back pain. In addition, its shape also aims to improve your sleep posture which can help prevent orthopedic health issues. Attractive and brand new design is offered by Xtra-Comfort bed wedge pillow! A solid natural extension of your body. Whether it is low or high incline you want, this pillow can adjust to your needs just by flipping the attached triangle piece. Indeed, it is an absolute godsend, a circulation masterpiece. No more endless pile of pillows that don’t live up to your expectations. You’ll love its decent size and beautiful support. 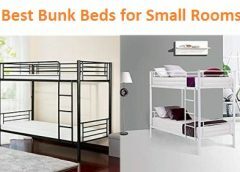 You don’t have to worry about staying confined in your bed for extended periods of time anymore. Once you purchase it, there’s no going back because it will remain part of your daily life. The measurement of this pillow is 28.8 x 13.5 x 12.5 inches. It is usually enclosed in a small box and you might be shocked at first about your purchase. However, just give it overnight to expand and it will be as firm as you expect to be. It also has a carry handle that brings you convenience especially when you travel. 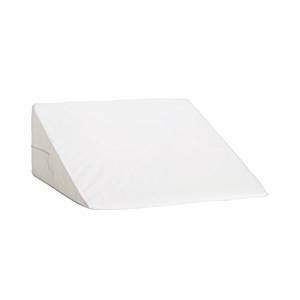 This wedge pillow features a soft cover made from breathable polyester material which is machine washable. You will know that it is firm on the inside but at the same time it also has that quality of memory foam softness. Can’t sleep because of your back is aching? It will disappear when you use this. How about sleeping on your stomach to feel some relief? You can do that too using this pillow. Overall, the pillow itself has an awesome construction and it is super sturdy too! And unlike others, it only has a slight foam smell which almost always disappear within 24 hours after opening. Aside from helping you after a surgery, this pillow can help relieve tension in the neck and back. 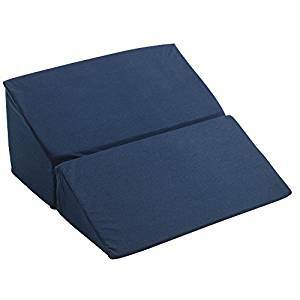 And since there are various ways to fix the wedge pillow, you can use its multi-position to your advantage – whether you are trying to cast away chaos on your head, back, or legs. Living and sleeping soundly has never been easier, but with MedSlant BIG Acid Reflux Wedge Pillow it is possible! Don’t hesitate to order this people because really, it works mysteriously. Its quality is exemplary and odor-free. Definitely recommended for those who suffer from GERD. Do you want to have something that has been proven and tested over the years? That is MedSlant for you. There are so many testimonials of people who have passed on their love for MedSlant wedge pillow and they never turn to other brands anymore. The reason for it is simple, MedSlant keeps on innovating to make sure your utmost comfortability. Similar to the previous pillows, it is also compressed for shipping purposes. Once the pillow takes it normal form, it should be 30 x 32 x 7 inches. Usually, it will be ready in a few minutes. However, there are also some people who experienced unwrapping the pillow and they were not able to use it immediately. If that happens to you, observe first and if it takes more than a day and nothing happens yet, you may contact MedSlant about it. Crafted from soy, poly, foam – you have a memory foam that is firm and comfortable. It also has a microfiber zipper cover that can easily be put and taken off. But most importantly, it is hypoallergenic! You can sleep soundly and wake up refreshed without the pressure of something bad happening once more. For more proof, it is made without ozone deplters, PBDEs, TDCCP or TCEP flame retardants, mercury, lead, and other heavy metals, formaldehyide, phthalates, low Volatile Organic Compount (VOC). It provides real relief, especially those suffer from terrible GERD and heartburn. With this, you’ll be able to have a restful sleep. If you’re still skeptical about it, you can read many reviews from customers who swear on the extra comfort it offers. It might be expensive than other brands but think of it as a long-term investment that will make your life easier and better. As a tip in preventing acid reflux, you can use the wedge pillow with your head elevated between 6 to 8 inches. However, don’t put your efforts into vain by avoiding prohibited foods. Remember, prevention is still the best cure. A good night’s sleep is what you deserve and Xtreme Comforts Memory Foam Bed Wedge Pillow provides it for you. You will never know comfort unless you try this. Left side, right side, whatever positon you want to sleep in, you will always find yourself in awe of this product! Pondering on buying an adjustable bed? Perhaps, you haven’t had the chance to see this wedge pillow. Help improve your sleeping habits by choosing this. Unlike others, this pillow is all that it claims to be. Many people who usually snore on their sleep have successfully recovered through this. Its dimensions are 17 x 7 x 7 inches. It is constructed from 2 solid wedge layers that delivers ideal softness for side sleepers and back sleepers. Because of its shape, the head and neck can sink in the pillow for spinal alignment at a 30 degree angle that greatly reduces acid reflux, post nasal drip, snoring, colds, cough, and more. It has a posh bamboo casing which helps in the perfect circulation of airflow and provides comfort through its surface. You can easily have back support, knees for lower back, and leg support. Its vision is rooted in the desire to, “Give You Relief and Better Your Life”. If you are the type of person who suffers a condition of a stressed back, you don’t have to endure it anymore! No snoring, no daytime naps, no morning headaches caused by lack of oxygen or congestion when you have this. All in all, it is a pretty awesome wedge pillow! Your next dream bedtime partner is Brentwood Home Pfeffer Therapeutic Gel Foam! Tuning in or binging on your favorite shows is now made possible with this. On the other hand, if you are just looking for a pillow that can help you sleep, this wedge pillow also gives that power to you. Sleep in an hour! Ease chronic problems such as respiratory issues or acid reflux by purchasing this pillow. Sleep soundly and start your road to achieving your personal wellness journey goals. The size of this wedge pillow is 24 x 24 x 8 inches. But if you want something much bigger, there are two more sizes which are: 24 x 24 x 11 inches and 24 x 24 x 13 inches. It is rolled up in a box upon delivery and secured through an air-vacuumed plastic. To fully see its maximum fluff potential, just let the pillow breathe for a while. If you are unsure what side you should use, you can always open the zipper and find where the side of the gel is. The inner part is made up of visco elastic memory foam that helps the wedge pillow be firm and retain its shape. The gel on the top layer is infused to ward off the heat coming from the surface and help you feel cool all through the night. Meanwhile, the outer part is a polyester knit that is machine washable. The material allows the cover to get rid of moisture so that you can stay dry. As its name suggests, it is a therapeutic foam wedge. Similar to other wedge pillows, it aids in elevating the upper body, legs, or as a trunk stabilizer when you lie on your side. Is a soothing sleeping experience your target? Splendoress Bed Wedge Pillows maybe the one you are looking out for. When it comes to overall health improvement, this pillow has amazing significant advantages. For those with back problems or scoliosis, here’s a special treat just for you. Transform the way you live your life and have a bed wedge pillow you can depend on to make your life cozier. This one’s easier to maintain since it has a removable cover and has an excellent gradual incline that gives you ultimate relief. It is made with high-density memory foam that helps you support your body well. It can either be used in your bed or when you are sitting on a chair. The material guarantees that you will stop snoring in no time and that you will be able to sleep soundly to have the rest you deserve. If you are thinking twice because of your allergies, you don’t have to find an alternative option because the cover is hypoallergenic – such a good deal, right? Its cover must be washed under delicate or wrinkle-free mode. Also it should be tumbled dried to prevent shrinking. The first thing you need to know is that this pillow is created only for light use. It is best to follow the function it is intended for. It relieves the challenges of having bad shoulders and minimized the pain from it. Further, it helps in elevation, safety, and comfort of upper back and neck problems. Is your acid reflux troubling you? Snoring issues? Welcome the most comfortable, cool, and breathable pillow you can own. Relax Home Life wedge pillow has an ideal width, firmness, and incline which you can also pair with a regular pillow, only if you want to. Delivered to you vacuum packed in a small box and once opened, the pillow can immediately return to its shape with no fuss. You will no longer have to fix mound of pillows just to relieve the discomfort you are experiencing. Its design may be regarded as a typical clean look. However, its design specialty lies in the three (3) sizes they offer: a) 25 x 26 x 7.5 in, b) 30.5x 33 x 12 in, and c) 30.5 x 33 x 7.5 in. Hence, because of the several sizes they offer, you have the option to choose what kind of coverage your body needs. The wedge pillow is triangular and has a 1.5 inch memory foam top layer that allows you to sleep well in any position you like. The bottom, on the other hand, is composed of a firm base foam that fully supports you especially when your back is elevated. Not only that, the pillow also comes with a bamboo viscose cover, a premium quality case that is both soft and lavish. You might be thinking, what’s so good about the cover? Well, aside from it is perfectly machine washable, it is also hypoallergenic and dust mite resistant too! An ideal slanted cushion meant for improving your circulation while also helping you achieve proper spinal alignment which decreases lower back pain. You won’t have to wake up anymore with a painful heartburn in the middle of the night when you have Mabis DMI Foam Bed Wedge Pillow and get the rest you deserve. Light as a feather yet solid as a brick is the perfect description of this bed wedge pillow. It has just the right height and you won’t slide down while sleeping. If you like sleeping on squishy things, this may not be the pillow for you. However, if you want something firm and something that will last longer, this works impeccably. The pillow comes in white and blue color. It comes in three sizes: 10 inches, 12 inches, and 7 inches. 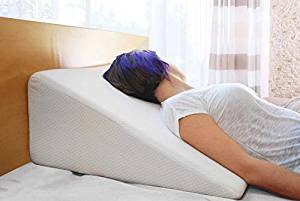 Crafted with foam bed wedge, this pillow’s main function is to allow you to raise your head and chest to solve issues such as acid reflux, GERD, and other respiratory problems. The best thing about is that no matter what you do, the pillow still maintain its shape and does not wear out easily. It is also a good leg rest especially if you have sports injuries. It is also paired with a polyester cotton cover that is machine washable! If there’s one thing that can accurately describe the pillow is it has precise angles that can make your breathing easier and at the same time relieve pressure from your chest. As a result, instead of experiencing pain, you go towards the path of dreamland. Here are some of the issues it eliminates: acid reflux, varicose veins, phlebitis, restless leg syndrome, neck and shoulder pain, snoring, respiratory issues, and more. Multi-purpose wedge pillow that is available in three (3) functions and a practical choice if you are on a budget. 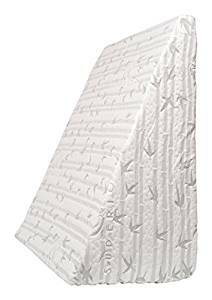 Back support, relieving back pain, and elevating your legs or upper body – Olee Sleep Mattress Bed Wedge Pillow will surprise you at how dependable it can be. There’s no better reward after a long day than a restful sleep or a pillow that allows you to relax at any position you prefer. Moreover, you can also use this wedge pillow at work since it looks stylish and could always be within your reach. What more could you ask for? Weighing approximately five (5) pounds, it measures 9.5 x 22 x 24 inches. Made with ventilated memory foam, this pillow is one-of-a-kind. It is made to be ultra-comfortable and give you great support throughout the night. It also follows the shape of your body and cradles it while you sleep soundly. A drug-free solution to your night-time heartburn, body aches, sinus problems, and more. It is a great option when reading, lounging, or binging on your television. You can also use it as a knee support when you are using your laptop. 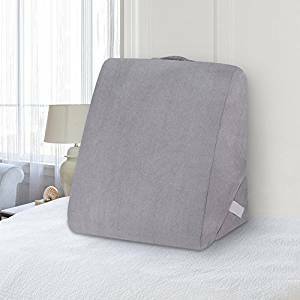 However, you must know that the angle of this pillow is ‘too straight’ – if you want something like that for your back issues then this is ideal. Further, the cushion is guaranteed to be soft and well-produced. 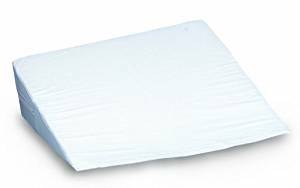 Get back the circulation you need with InteVision Foam Bed Wedge Pillow! 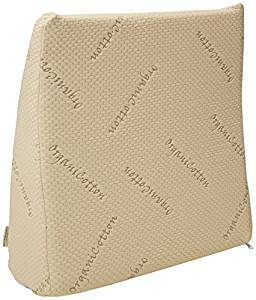 Stop your suffering once you purchase this wedge pillow because your lower half will never have to put up with pillows piled up anymore. To a greater extent, this could provide you an amazing support no matter what weight you are in right now. What everybody wants is a nice wedge pillow that can outlast other pillows and this is exactly what InterVision offers. You don’t have to search for more because aside from having over a thousand reviews all over the internet, the 12 inch high incline is definitely a steal considering its price! This product is available in two sizes: 26 x 25 x 7.5 inches and 28 x 25 x 7 inches and there’s really not much difference between the prices of the two, if you’re worried about that. The base layer is created with a firm foam and the top layer has a 1 inch memory foam. Since both layers are combined, they help increase air circulation. 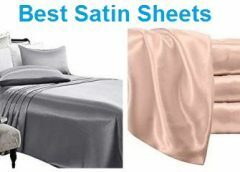 And because it is a popular choice among consumers, it now has the 400 thread count and has a 100% Egyptian cotton pillowcase. It is made with the intent to provide firm cushion and at the same time give your body ample support to raise the upper body. It is best used by people who has poor circulation, acid reflux, and neck and back problems. You can also use it if you are a side sleeper. No more pain, no more swelling, and no more just settling for typical pillows out there. You now have an economical choice if you are worried about your budget. Easy to use and guaranteed that you will be comfortable when resting, reading, or sleeping. Get your own Abco Tech Bed Wedge Pillow now. It is a seamless leg cushion that is meant to support your leg, knee, and ankle. Its angle is meant to allow you optimal healing by decreasing the blood flow on the injured part of your body. If keeping your spine straight is vital to your lifestyle, here’s a supreme wedge pillow for you. This product is available in one size only: 25 x 24 x 12 inches. Its weight is approximately 5.8 pounds. 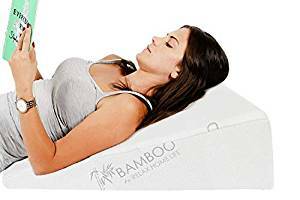 This pillow is made with high-density premium foam material that follows the shape of your body and has a guaranteed firm support at any weight you are in. Even with longer sleeping hours or working hours, you are assured that it maintains a cool temperature, giving off a firm and breathable style to your life. Aside from that, it has anti-bacterial properties that is good for your sensitive skin and body. Since it is hypoallergenic, you can use this to solve your respiratory and snoring issues. 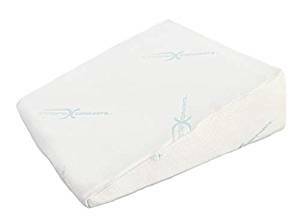 It is also paired with a washable and removable cover, a convenient option especially if you want to maintain the pillow’s pristine condition. Aside from solving the above-mentioned issues, this pillow is also good for just relaxing or simply naturally sleeping on your back. Since it is quite huge, it can hold both of your legs for maximum comfort. But at the same time it could also be a hindrance if you have limited space in your home. Have a safer, deeper and restful sleep with Mabis DMI Foam Bed Supportive Wedge Pillow! Looks simple but it could do so many wonderful things for your body. If you suffer from leg cramps, swelling, and pain – this will create a zero-gravity environment so you can deal with the distress effectively. Want something to lessen your stress? This wedge pillow will surely reduce the signs of aging in your body. You won’t have to worry about relieving your back pain, recovering from back pain, and improving your circulation because this will help you sleep efficiently. This product is available in two colors and its measurement is 10 x 24 x 24 inches. Some who have tried purchasing this said that there’s a faint chemical smell once they received the package. However, you don’t have to worry because they also said that sometimes it only take a few hours to days before the smell is completely eliminated. Made from high-density memory foam, it provides you comfort and prevents blood stagnation. If you want something firm rather than soft, this is an awesome option for you. If you are the type who wants something flat in your back, legs, hips, or knees – this is a perfect package. Not only that, the wedge pillow also comes with a washable polyester cotton cover that comes with a zipper. This pillow has several medical advantages and it is a natural treatment you shouldn’t forego. If your muscles and discs are suffering, this will help you reduce the pressure and decompress your back. Want something versatile? The Drive Medical Pillow comes in two pieces that you can fold anytime and a model companion when you take long trips away from home. Don’t hesitate to purchase what you exactly need and help yourself to breath better and live your life longer. Modest and classy design that never flattens, even if you use it daily. It is designed for you to maintain the natural shape of your lower spine and the coccyx. If you are a traveler or someone who wants to rest outside the comfort of your home, you have to try this! You have many choices because the same design comes in three sizes: a) 23 x 23 x 7 inches, b) 23 x 23 x 10 inches, and c) 23 x 23 x 12 inches. The first size is good at solving acid reflux and sleep apnea. The second one helps you relieve your sore muscles, aches, and pains. And the last one is a good support for your spine or when you want to watch television. Crafted with a strong and sturdy polyurethane foam, you are assured that it will never change its shape. It is an ideal hospital-grade support you can use during the day or night. And as mentioned, the pillow is highly adjustable. It also comes with removable and washable nylex cover that makes it more attractive. Nylex covers are meant to be soft on the skin and has anti-microbial properties. Further, they are also flame-retardant and fluid-resistant. With this, you’ll see gradual improvement in your snoring issues as well as if you experience acid reflux, GERD, and heartburn. Some even said they used this for recreational purposes such as improving their sexual life and it worked well for them. After all, it is up to you what purpose you want it for. Stay healthy and energetic with a Superior Wedge Shaped Memory Foam Pillow! This maybe the change you are waiting for. Choose comfort and easier breathing when you have this in your home. 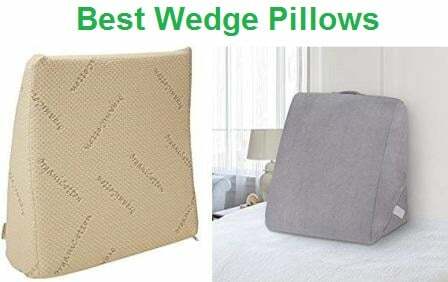 Pick the best one that gives you all – comfort, size, and features, the three most important factors you shouldn’t overlook when picking a wedge pillow. And while it’s quite easy to regard this, your muscles, tissues, and other body part needs the support of this therapeutic pillow. Available only in one size: 24 x 12 x 26 inches and it weighs approximately six (6) pounds. Since the size is quite humongous, it is highly recommended for back support, reading, and watching television. 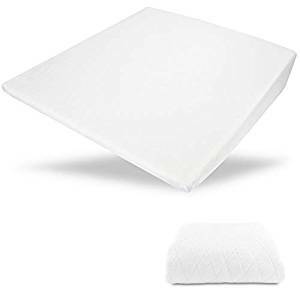 It is a two-layer designed pillow where the top form is made with memory foam and the base is made out of polyurethane that is good for firmness and support. On the other hand, the pillow cover is made from 60% microfiber and 40% rayon from bamboo – 100% removable and machine washable. Great for people suffering from back pain, acid reflux, sciatica, allergies, snoring, and more. Improve your spinal alignment and soothe the pain you feel by using this pillow that target areas to alleviate the pressure you feel. Moreover, since it is big, you can properly elevate your head and neck, thus preventing the upward flow of the acid in your stomach.